The Hamilton Jazz Society presents The Good Vibes in concert Sunday 31st July, 4.30 - 7.30pm, at the Waikato Commerce Club, 197 Collingwood Street, Hamilton. 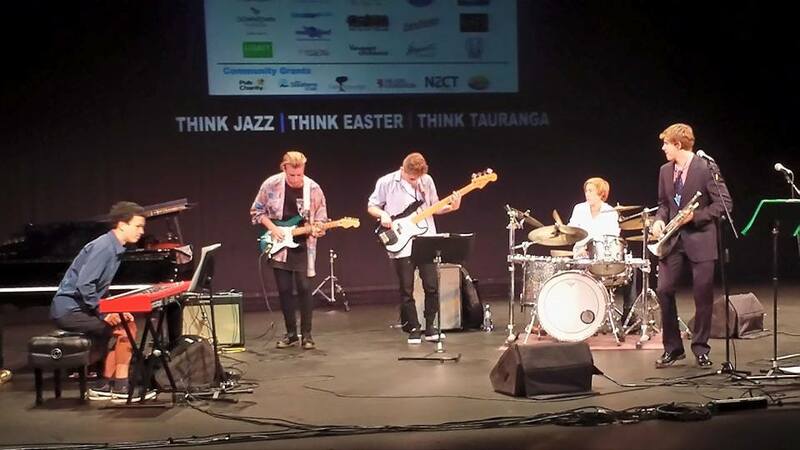 Spotted at the recent Tauranga Jazz Festival, The Good Vibes, talented teenagers James, Theo, Harry, Leon and George are very much at home in the Jazz-Funk genre. Mentored by Finn Scholes, "We clear the nose and soothe the throat with our music and all that Jazz." The Good Vibes have participated in the Tauranga National Youth Jazz Festival since 2014, winning awards for Most Outstanding Trumpet/Flugel Player (2016, 2014); Best First Year Performance (2014); Best Performance of a NZ Composition (2016); Most Outstanding Pianist (2016); Most Outstanding Keyboard Player (2015). Mark your calendars and join the Hamilton Jazz Society for a fun-filled afternoon of music and dancing. Beverages, snacks and dinner are available for purchase. 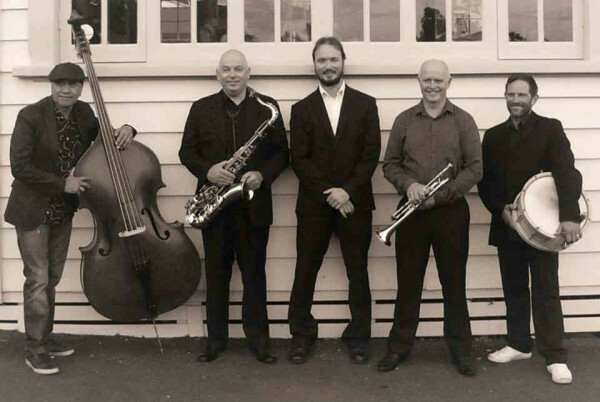 West Coast Jazz Band are a five piece jazz combo based around the Raglan area. The band specializes in playing straight-ahead jazz tunes and standards, from the “cool” styles of the late 50’s, through to the present day. Their main influences include; Miles Davis, John Coltrane, Bill Evans, Ahmad Jamal, Sonny Rollins, Art Blakey, Horace Silver, Charlie Parker, Thelonius Monk and the like. Formed during 2012, with the nucleus of: Greg Taylor – piano, Jack Porima – bass, and Bill Forrest on saxophone, the band has steadily progressed to include drummer Freddy Limbert, and trumpet player Grant Mason. Each member has played in previous outfits, which subsequently led to a commonality between the players – the love of jazz. This, along with accumulative musical skill, dedication, and a desire to push their musical boundaries, ultimately led to the forming of the band.